Jason Ackerman fills us in on his experience running both a Sectional and Regional. Jason Ackerman pens in his thoughts about organizing and executing both a Sectional and Regional event in the Northeast. Final results in from Albany. What a wild finish that unfolded here at the Northeast Regional Qualifiers. After a fantastic conclusion in the Affiliate Competition, the individuals stepped up to their last obstacle of the weekend, and what a test it was. Event three and day 3 heat assignments announced! Returning competitor will be hard to beat. An inspiring story from the NY/NJ Sectional. The female division is stacked. Former skier turned oly lifter competing for the Games. Last year's competitors will be hard to beat. Kyle Sikes had a strong showing at the New England sectional and is hoping for a spot at the 2010 Games. Proud papa competes for Games stardom. After two tours in Iraq, JP Mummey made his way back to the states with a new found love for CrossFit. He'll be competing in Albany for a spot at the 2010 Games. Former fighter turned CrossFitter competes for the Games. Mike McKenna is the proud new owner of CrossFit 914. 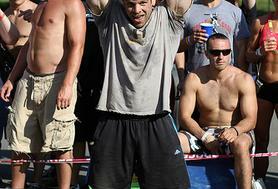 After finishing first in the NY/NJ Sectional he's hopeful for a spot in the 2010 CrossFit Games. Former collegiate footballer looks for a spot at the Games. Mike Kaseman used CrossFit to change his life. Now he is coaching rugby and hopes to make the same positive change in the lives of his athletes. 2nd Place finisher at the NJ/NY Sectional. Distance athlete used CrossFit to recover and improve. 4th place finisher form the New York/New Jersey Sectional is ready to take on Albany. First place finisher from the UK/Ireland Sectional brings it home to the States. All the info you'll need to enjoy the NE Regional. Jason Ackerman has some news and information on what you will need to know before heading to New York State's Capital. The following note comes from Jason Ackerman of Albany CrossFit. The following message comes from the organizers of the Northeast Regional event. If you were on the fence before, now is the time to help your local community and participate in CrossFit Games action first hand. 2nd place finisher at the New England Sectional. Sarah Scholl is the owner and head trainer at POWERx TRAINING in Darien, CT. Her background in competitive running lent well to her results at the New England sectional, finishing second overall behind the pre-qualified Heather Bergeron. Representing CrossFit Dewitt with a 3rd at Sectionals. 1st Place finisher from the New Jersey Sectional. Check out the action from the east coast. Weekend recap from Gregg Arsenuk. The following report on the New York/New Jersey Sectional comes from Gregg Arsenuk of Guerilla Fitness. Schedule, heats, workouts and logistics for this weekend.